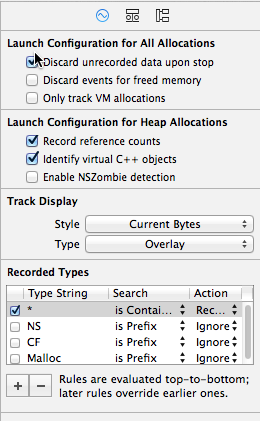 Instruments is the developer tool that has the most user interface changes in Xcode 6. This article details the changes I noticed when using the new version of Instruments. The lower right corner of the trace document window contains settings and configuration information. The Record Settings button, which lets you configure what the instrument records. The screenshot shows the recording options for the Allocations instrument. The Display Settings button, which controls what appears in the detail view. The Call Tree checkboxes and the data mining options are in the Display Settings section. The Extended Detail View button, which shows the extended detail view. Click the + button to open the Library, where you can examine all the available instruments. Drag an instrument from the Library to the instrument list to add an instrument to your trace. The group of three buttons works with the Time Profiler instrument and controls what appears in the graph. Clicking the left button shows the CPU strategy, which creates a track pane for each CPU core. The CPU strategy lets you see how well your app uses each core. Clicking the center button shows the Instruments strategy, which looks like every other instrument. Clicking the right button shows the threads strategy, which displays CPU activity for each thread.